I think that may of you listening to my podcasts are readers of the books from Napoleon Hill. 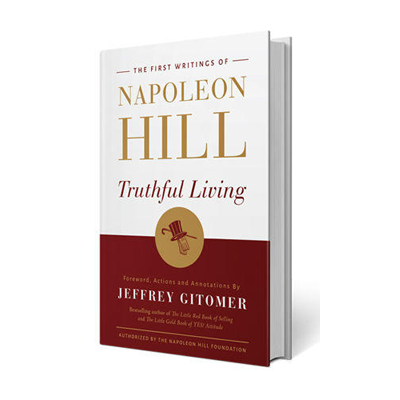 I have a special guest on this podcast, Jeffrey Gitomer and he has taken the content from the first writings of Napoleon Hill which are over 100 years old and put this into a new book entitled “Truth Living“. In our interview together we discuss some of the 23 Lessons that Napoleon Hill teaches throughout this book, with commentary by Jeffrey Gitomer. Success means different things for different people, but I think we can all agree that there are certain principles that never change and because we are creatures of habit we need to be reminded of the simplicity of these principles. Lesson #1 is Success Is Up To You, while this sounds so simple and it is– “The ability to succeed is a matter of self-inspiration and a full understanding of human nature and a knowledge of your own mind’s latent powers.–Napoleon Hill. As Jeffrey states thousands and thousands of people will read “Truthful Living”, but less than 5% will adopt the principles, take action necessary and receive the rewards presented in the book. Lesson #2 Finish What You Start, again something we all know. “It seems to me that one of the great purposes of life is to: BE HAPPY ALL THE TIME AND TO MAKE OTHER HAPPY!”-Napoleon Hill. As Jeffrey states “Finishing what you start requires that you take cynicism and negativity and convert them into optimism and positivity. Drive. Determination. And a vision to see the outcome and take daily steps toward that goal, or as Hill would say, that “definite major aim”. Truthful Living is filled with wonderful lessons and commentary from author Jeffrey Gitomer. It is one of the most well laid out books I have seen in sometime, easy and fun to read. If you want to learn more about the author just click here, if you want to learn about the Napoleon Hill Foundation just click on the name to be directed to the Napoleon Hill Foundation.